When it comes to garages, it’s widely agreed upon that prefab steel is your best option for making the garage of your dreams. There are plenty of reasons why! Building a garage can be a stressful experience, so it’s important that you choose the very best option so you get it right the first time. Consider the size and layout that will make the most sense for you and your vehicles, and go from there. 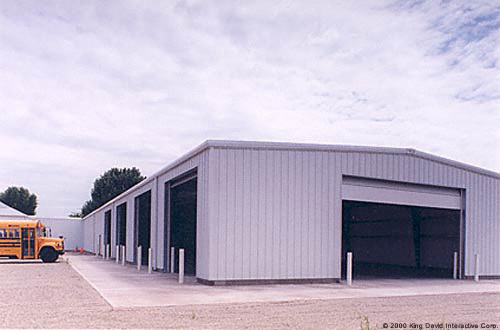 Here are just a few reasons why steel buildings are best for your perfect garage. With prefab steel, the process of construction is a lot less time-consuming than other methods and materials. Because so much of the construction is done in a manufacturing location before it even gets to your job site, there are much less work to be done in order to complete it. A project that might have normally taken weeks or even months to do can be done in days. This means you’ll be able to put your garage to use much sooner than you would otherwise. Our prefab steel buildings come with plans, directions and a simple method that allows you to complete the job in a much shorter time span. This will also give you plenty of time to take advantage of steel’s flexibility and make any customizations to the structure before you put it into use. Steel is incredibly durable and can stand up to all kinds of weather conditions. This is great for certain parts of the U.S. where the weather changes frequently. From heavy snow to high winds, steel can withstand all types of conditions. Steel is also resistant to the types of things that generally affect other materials like wood. Pests like termites are unable to cause damage to steel in any way, and steel is also fire resistant. This means added safety for your vehicles stored inside since much of these things can compromise the integrity of your building in a way that can cause some serious damage. From rapidly spreading fire to falling pieces of concrete that has suffered from cracking, it’s important to know that steel removes all of these risks indefinitely. On average, prefab steel structures cost about 30% less than purchasing the raw materials required to building a similarly sized structure. This is great because the money that you save can be put towards other parts of your budget, including customizing your steel garage so it’s exactly how you want it. Consider add-ons like a workbench or tool storage so that if there’s any work required on your vehicles and you have the know-how, you can do it on your own. Another great feature of steel structures is how little maintenance they require in order to stay in good shape. While annual inspections are recommended, your steel structure will be able to go for much longer periods of time before they need any type of repairs or even replacing. This is also great so your vehicles will always be kept in an environment that’s in the best possible shape.